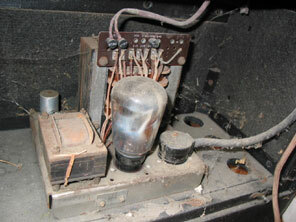 Shown here is the Murphy A28C console receiver. This is the only console receiver pictured in all the Murphy pages on this site, and there are particular reasons for this, notably because the A28C was available only as a console, there being no table version. Most console receivers in the Murphy range over the years employed the same chassis as the table receiver(s) for that year, but housed in a floor standing cabinet with improved speakers etc. 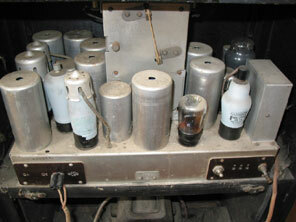 However, the A28C featured 8 valves plus rectifier, instead of the more common 4 valves plus rectifier found for instance in the table model A26 of the same year. Chassis views are shown below this text. The A28C was really quite expensive at £21.15.0, some twice the price of the A26 table model of the same year. Also available was the A26C console receiver at £21.15.0, (which was a version of the A26 table model). Therefore the purchaser had paid about 50% more for the added refinements offered by the A28C over the A26C. The attention to detail is very good on the A28C though. The tuning scale is really rather restful, backlit in a red glow, but takes 5 lamps to illuminate. The speaker, pictured above right, is massive (notice the pound coin for comparison), just looking at it you know the sound quality will be good. 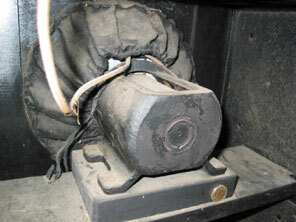 At the back of the receiver is a metal pocket for keeping the station chart supplied with the receiver in place, such that it is out of sight, but where the booklet can be easily found if required. The metal pocket is tastefully finished in a black crackle-paint finish, even though it is at the rear of the receiver. 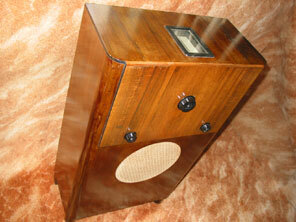 Murphy was so confident that the tonal reproduction of the receiver was near perfect that no tone control was fitted to the front of the receiver (even the A26 table model at half the price had variable tone control). All that is available on the A28C is a push/pull switch at the back of the receiver, and the instruction booklet emphasises it may be used to reduce interference and background noise. Console versions of table receivers like A26C and A30C do turn up on occasion, but the receivers available only as console sets like the A28C and A40C are rather rare now, as they were outside the price range of most buyers.